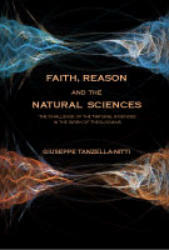 Title: Faith, Reason and the Natural Sciences: The Challenge of the Natural Sciences in the Work of Theologians Author: Giuseppe Tanzella-Nitti Imprint: The Davies Group, Publishers soft cover 286 pp. USD 27.00 ISBN 978-1934542125 May 2009 In Faith, Reason and the Natural Sciences the author attempts to go beyond Non-overlapping Magisteria, showing why the sciences constitute a fruitful challenge for theologians’ work, and the insights of Judaeo-Christian Revelation constitute a source of understanding for scientists’ ultimate questions. The author’s intent is not to convince non-believers to believe in God, but rather to help them better evaluate the motivations for their unbelief— motivations that may rely upon an erroneous judgment about what science is or says, or what faith in God is supposed to be or teach. The intent is, rather, to help all—believers and non-believers alike—to practice a sincere intellectual honesty, recognizing that the questions we address to this incredible universe will always exceed the answers we receive. Contents Introduction Chapter 1. Is Scientific Knowledge Relevant to Theology? Chapter 2. Nature as Creation: Science and Theology on the the Ultimate Questions Chapter 3. The Anthropic Principle and Theology Chapter 4. Extraterrestrial Life: an Interdisciplinary Approach Chapter 5. The Word-Logos in the Work of Creation and Scientific Knowledge of Nature Chapter 6. The Laws of Nature between Theology and Science Chapter 7. The Theology of Miracles and the Natural Sciences Chapter 8. The Relationship between Faith and Reason in the Context of the Unity of Knowledge Bibliography Index of Names Author Giuseppe Tanzella-Nitti took his university degree in Astronomy at the University of Bologna (1977), and his doctorate in Dogmatic Theology at the Pontifical University of the Holy Cross, Rome, (1991). Italian C.N.R. fellow (1978–1981), he has been appointed Astronomer of the Astronomical Observatory of Turin (1981–1985). He is now Full Professor of Fundamental Theology at the Pontificia Università della Santa Croce in Rome. His fields of interest and research include Theology of Revelation, theological and philosophical images of God, the dialogue between scientific thought/contemporary culture and Christian Faith, and the Unity of Knowledge. He served as general editor of the Interdisciplinary Dictionary on Religion and Science (Dizionario Interdisciplinare di Scienza e Fede), a two-volume encyclopedia published by Urbaniana University Press and Città Nuova, Rome 2002. He directs the web site "Documentazione Interdisciplinare di Scienza e Fede", http://www.disf.org and is editor-in-chief of the "Interdisciplinary Encyclopedia of Religion and Science", at http://www.inters.org. In April, 2004 he was awarded the ESSSAT Communication Prize from the European Society for the Study of Science and Theology. He has published thirteen books and over one hundred scientific articles.